Ford Motor Co. F +0.30% will begin selling an F-150 pickup truck later this year that is modified to run on compressed natural gas, as demand continues to grow among commercial fleet buyers. Ford sold 11,000 trucks last year that run on natural gas, and that was double what the company sold in the years of 2009, 2010 and 2011 combined. Until now, Ford hadn’t made it an option available on the base F-150, reserving it for heavier-duty models and its Transit Connect delivery van. With the addition of the F-150, Ford expects to sell about 15,000 CNG vehicles this year, the company said in a statement. “We did this because customers were asking for it,” said Kevin Koswick, Ford’s director of North American fleet sales operations. Chrysler Group LLC and General Motors Co. GM -0.11% already offer compressed natural gas as an option on its half-ton pickup trucks and Ford offers it on its larger, heavy-duty pickups and vans. Of the Detroit companies, only Chrysler is installing the special tanks and fuel lines in the trucks at its own factory. Ford and GM send the trucks to an upfitter that installs the equipment. If women can’t read maps and men always lose their keys, there is at least one aspect about driving that unites the sexes: neither has a clue when it comes to identifying dashboard warning lights. Nearly all motorists who were asked to identify the huge display of warning lights that can now be found in many of the country’s most popular new vehicles struggled to work out what they meant. The Connected Car: What Apps Might be Built? The Connected Car is a creator of big data. What are the benefits of knowing the “where” of cars beyond traffic? What other applications of the data collected by “smart & connected cars” might we use? Our editors suggest the apps they’d like to see. In the past month, San Francisco International Airport officials have been citing and arresting drivers from mobile-app enabled rideshare companies that pick up and drop off passengers, an airport spokesman said. Regulation’s restraint on automotive disruption was discussed in the Asymcar 2 podcast. Subscribe to Asymcar podcasts: iTunes or RSS. Has Motorization in the USA Peaked? This study examined recent trends in the numbers of light-duty vehicles (cars, pickup trucks, SUVs, and vans) in the U.S. fleet. The analysis considered both the absolute numbers and the rates per person, per licensed driver, and per household. The period examined was from 1984 through 2011. The absolute number of vehicles reached a maximum in 2008. However, it is likely that this was only a temporary maximum and that the decline after 2008 was primarily driven by the current economic downturn that started in 2008. Consequently, with the improving economy and the expected increase in the U.S. population, it is highly likely that (from a long-term perspective) the absolute number of vehicles has not yet peaked. On the other hand, the rates of vehicles per person, licensed driver, and household reached their maxima prior to the onset of the current economic downturn. Consequently, it is likely that the declines in these rates prior to the current economic downturn (i.e., prior to 2008) reflect other societal changes that influence the need for vehicles (e.g., increases in telecommuting and in the use of public transportation). Therefore, the recent maxima in these rates have better chances of being long-term peaks as well. Consumer Reports has rated the Tesla sedan the best car that they’ve ever tested (list). Tesla has a market capitalization of about $14 billion (July 22, 2013). According to Wikipedia, Tesla seems to have required about $1 billion in debt and equity funding. The GM/Chrysler bailout required roughly $85 billion in taxpayer funds (Wikipedia). Instead of preserving these relics we could have instead have had nearly 85 startup automobile manufacturers on the same scale as Tesla. Wouldn’t that have been a lot more interesting and more likely to push forward the automotive state of the art? 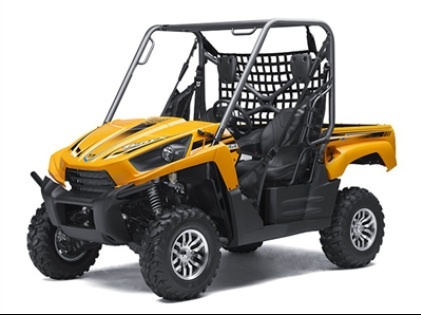 The Gator is a “side-by-side,” a four-wheel-drive, off-highway vehicle with dual bucket seating, retractable belts and automobile-style controls, also known as a recreational off-road vehicle (ROV). The side-by-side market is notable for two things at the moment. The first is increased federal scrutiny. ROVs are inherently less stable than their automotive counterparts, due to their high ground clearance and center of gravity, short wheelbase and narrow track, and limber, long-travel suspension. In 2009, after a slew of lawsuits against Yamaha, the company that broke the category open with the 2003 introduction of its Rhino, the U.S. Consumer Product Safety Commission demanded a voluntary repair program to effect modifications to that vehicle’s rear suspension. The feds have drafted new regulations intended to lessen the risk of ROV rollover and passenger ejection; the industry is pushing back, in part by promoting rider safety and responsible riding. Dulce et decorum est. Wear a helmet. The second notable thing relates to the first: These things are selling like crazy. 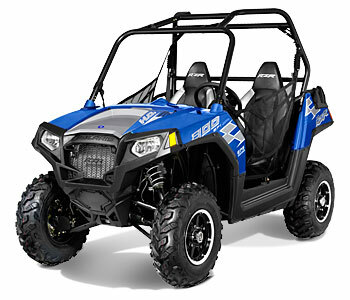 Category sales increased 22% in 2012, to 166,449 units, according to the Recreational Off-Highway Vehicle Association. And as the market proliferates, the machines themselves are mutating, resulting in a strain of super-aggressive sport side-by-sides, with top speeds as high as 75 miles per hour. 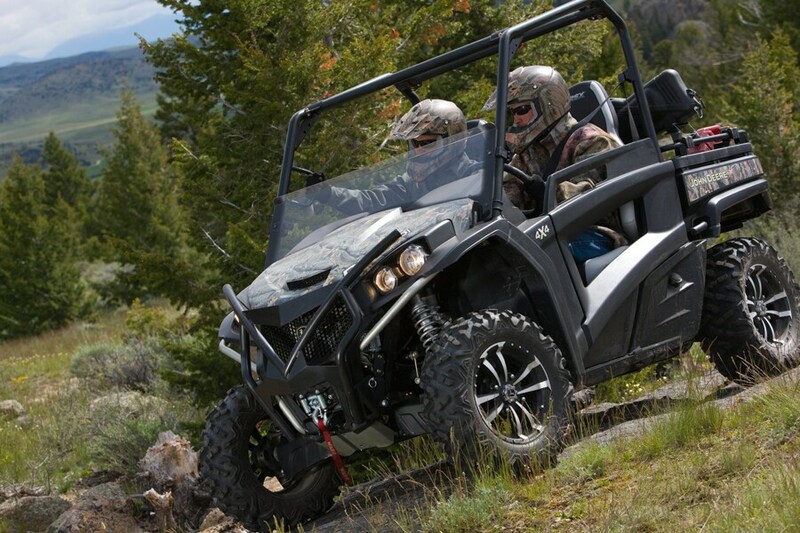 The Polaris RZR 800, for example, accelerates to 35 mph in 3.8 seconds and boasts a weight-to-power ratio of 18 pounds per horsepower. It’s a mere 50 inches wide, with a 77-inch wheelbase, set up on a dual-rate suspension with 9 inches of travel in front. These sorts of parameters send chassis engineers fleeing into the night. The dry-sump, 839-cubic-centimeter, 62-hp V-twin engine is made by, of all companies, Piaggio, and is billed as the first motorcycle engine used in the segment (that will be news to Yamaha and Kawasaki). John Deere estimates that the Gator consumes a gallon of gas per hour in average use. Look, these things are built-to-cost, outdoor toys, and they are not extravagantly engineered, frankly speaking. The bodywork and interior consoles are flimsy-feeling plastic panels that rattle concussively when the machine takes a hit. The brakes are grabby, the throttle is jumpy and the rack-and-pinion steering makes the Gator feel like an overeager golf cart. The high court imposed an injunction on the University of Birmingham’s Flavio Garcia, a lecturer in computer science, who has cracked the security system by discovering the unique algorithm that allows the car to verify the identity of the ignition key. The UK injunction is an interim step in a case launched by Volkswagen’s parent, which owns the four luxury marques, against Garcia and two other cryptography experts from a Dutch university. It complained that the publication could “allow someone, especially a sophisticated criminal gang with the right tools, to break the security and steal a car”. The cars are protected by a system called Megamos Crypto, an algorithm which works out the codes that are sent between the key and the car. “Best Drivers Report”. Where do American Cities Rank? The first task is to consider mileage. The Center for Neighborhood Technology’s Housing and Transportation Affordability Index estimates the number of miles that members of an average household travel by car in a year, broken down by city. Among our candidates, the average is 14,433 miles. (Garland, Tex., tops our list at 19,234 miles, while New York City is at the bottom with 9,375). We’ll incorporate this information into the data by creating a multiplier based on how many miles a city’s residents drive relative to the average. The Allstate rankings, for example, are based on the number of years between accidents. San Franciscans average 6.5 years between crashes, but they drive 74 percent as many miles as the average for cities in our survey, so we lower their years-between-accidents to 4.8 to account for how rarely they drive. We left our field and finished our çokokrem with the bread Sait’s mum had baked for us at around 830 am, stirred only by litter pickers on the beach (a comforting sight relative to Turkey). The road continued as the day before: it is the main highway from the coast to Tbilisi (the capital) and yet is only a single carriageway. It has a huge amount of traffic throughout the day including huge lorries with no other route to take, which means all of the other drivers are totally reckless in their overtaking and will glady stay on the wrong side of the road around blind corners to get around the next obstacle. This does not make for comfortable cycling on an already questionable surface, with constant horns blaring and three abreast overtaking commonplace on straight bits of road. It is not all bad, though: any side road is not drivable, thus free of traffic and filled with blackberries (though they tend to lead nowhere and are littered with potholes on any sections with Tarmac) and the Georgians seem to love their fruit, with plenty of in-season (ish) pear, apple and our first fig tree! An interesting place to start is to look at roads. It is unlikely much can be easily done in North America. Cars are components of very large systems that tightly bind society and technology erecting huge barriers to entry. I agree with Horace that studying the larger system makes more sense than just focusing on automobile technologies. An interesting place to start is to look at roads. In 1890 the safety bicycle was taking over Europe and America. It made short trips in towns and cities much more practical, but there were a couple of little problems. Mud and manure. Any amount of rain would turn the mostly primative dirt roads into mud swamps and the means of transit the bike was beginning to displace created a lot of pollution. One account of Manhattan in 1890 suggested horses left about two and a half million pounds of manure and sixty thousand gallons of urine every day. Hot summers must have been somewhat less desirable than what we now experience. Early automobiles, problematic as they were, represented such an improvement over the horse that people flocked to them. Crazy and not so crazy ideas were tried and something that seemed like a modern car emerged by around 1930. Just as important was the infrastructure. A serious national road system was proposed for bicycles with real work on automobile highways taking place in the teens. Much of what became the Interstate system was on the drawing board by the mid 1930s. iOS in the Car appears to be Apple’s first significant new hardware product that isn’t a standalone device. It’s an outgrowth of the company’s car integration features, which originated as a way to control music playback from the iPod. Between the iPod’s release in 2001 up until 2003, Apple experimented with basic serial interfaces, starting with iPod Accessory Protocol. This morphed into the more sophisticated Advanced iPod Remote (AiR) with the capacity to depict artist and title information, navigate songs within a playlist, handle shuffle playback and even show album art. Of course, the real costs are hard to peg. Most experts on autonomous vehicles say that at least initially, the robot trucks will have to run on roads separate from regular vehicles, or via embedded roadside beacons. That won’t be cheap. And then there is the primary issue of safety—of the cargo and people on the roads. Most in the industry believe that machines should eventually become better drivers than humans. It is going to take a long time to prove the case to governments and the public. But a payoff awaits. The U.S. government estimates the costs of truck collisions at $87 billion a year, with 116,000 people either killed or injured in truck and bus crashes. “Intuitively we all understand that driving is stressful, but it was surprising to see how high,” he said referring to the results of nine preliminary tests where he and others were wired up with a variety of stress sensors as they cruised around the Boston area. He readily admits he’s not crazy about driving. “I’m OK with it. I realize I get quite stressed out looking at the results,” he said. So someone else might respond to traffic in a different way. “We want to identify what factors trigger stress,” he said. A question that troubles me a little – and might trouble others, such as London mayor Boris Johnson, even more – is this: how responsible is it to urge people to take to their bikes on the streets of London, Paris or New York? No one is more persuaded than me of the unique powers of the bike – transportational, ecological, and epidemiological. But the virtues of the bicycle need to be accommodated within an integrated transport system and accompanied by public acceptance of the right of two-wheeled traffic to occupy the carriageway. That is the case in Amsterdam and Copenhagen and Vienna but not in London, where it seems most drivers regard bicycles as a nuisance and treat cyclists with a shocking and sometimes murderous lack of consideration. I suspect things are not much better in Paris and New York. There is even the ludicrous idea of making cyclists pay a “road tax”, a fiscal measure that was abandoned in the UK in the 1930s. The inevitable consequence of this hostility is a regrettable attitude of retaliatory anarchy among certain cyclists, which risks turning pedestrians into the victims. Cyclists, of course, should not take to the pavement (except where a pavement incorporates bike lanes) but, if you were a cyclist and had a choice between being crushed by a bus or lorry and riding on the pavement, I expect you would take measures to save your life. The statistics for deaths and serious injuries among cyclists in Britain, including in London, make dispiriting reading for anyone contemplating putting on their cycle helmet. Annual deaths in the past 10 years in London have fluctuated between 20 and eight; last year’s figure was 14, down two on the previous year’s 16. Serious injuries, at 657 in 2012 compared with 394 in 2002, have risen in number but fallen slightly in proportion to the number of bike trips made. The Hertz Corporation (NYSE: HTZ) is announcing the global launch of Hertz 24/7, (www.hertz247.com or www.hertz.com) a revolutionary new rental service available any time, day or night. The expansion is a game changer for the industry because for the first time customers will be able to rent a wide variety of vehicles near their home or work when needed and for any length of time — hourly, daily, weekly or monthly. The company estimates that by 2016, it will have “self-serve” vehicles within minutes of the majority of the United States population. More than a decade on, a new game-changer looms: BMW’s i electric car range. The i3, in particular, will be a mould-breaker. Not just for its engineering, but also its retailing strategy. Here’s how it will work. Electric i cars can be sold directly by BMW. You will be able to click-and-buy online and your car will be delivered to your door (already possible with bananas and books but still revolutionary in the antediluvian world of car retailing). BMW i stores – the first was in Park Lane, London – will offer a ‘retail experience’; they will not look like parking lots. Customers will lease, rarely buy, so a ‘recommended retail price’ is irrelevant. Leases will be flexible. If you don’t get on with your car, you can stop the lease. You will buy mobility packages, not a car. Prices will be fixed with no haggling. You will be able to purchase different packages, not least a flexible mobility deal that allows you to use petrol or diesel cars when a long drive beckons. It’s all thanks to a BMW car-sharing-fleet. Another mobility package enables users to access various forms of BMW transport, all from your smartphone app. So I can collect electric or petrol cars from reserved parking places, but also use scooters, fold-up bicycles (and even trains). BMW will also have its own Zipcar-like car-sharing scheme. In many ways, electric cars work best when they are shared. Naturally, their usual parking places will be alongside recharging points. BMW has already announced its ‘Genius’ programme, modelled closely on Apple’s. These are tech-savvy experts who work at dealers, although you can also ring them if the idea of going to a retailer is too unpalatable. Little wonder that the new i cars – note the Apple nomenclature again! – were the catalysts for these Geniuses. (If they are Geniuses, what, I wonder, are normal BMW car salesmen?) Car retailing may finally be revolutionised. Intriguingly, part of the solution to the perennial problem of selling cars may well be that cars will not be ‘sold’ at all. Sales of electric cars in Europe have been stuck in the slow lane, but could that change as governments and private companies become more involved in providing public charging there? On Monday, ABB, the Swiss electric engineering and power grid company, announced that it would install a national network of 201 fast-charging stations in the Netherlands. Cal Lankton, director of electric vehicle infrastructure for ABB in the United States, said in a telephone interview that the solar-aided stations, which can fully charge a car in 30 minutes or less, will be installed by 2015 at service stations on ring roads and other intracity locations throughout the Netherlands. ABB said that when the network is complete, all of the country’s more than 16 million people would live within 31 miles of a fast-charging station. Transit experts say these new services, which appeal to younger riders, could play a crucial role in ending the reign of single-occupant cars (and unending traffic) in Los Angeles, and many young residents have embraced them as a cheaper, more reliable and, well, more fun way to get around the city. But some of the city’s licensed cabdrivers have another name for ride-sharing services: illegal bandit taxis. Gaining access to listeners in cars is a key part of Pandora’s strategy to win more of the $15 billion market in local radio advertising in the U.S. More than half of radio listening occurs in automobiles. While Apple’s built-in voice controls, called Eyes Free Siri, will navigate to any application, it defaults to its own programs when a user makes a music request, Greenfield wrote. Greenfield says he expects Google Inc. (GOOG) to take a similar approach to Apple in marrying hardware and software design when it debuts an YouTube music service in the year ahead. The new i3 is also the first road-going BMW model to be based around an all-carbon-fiber body. For development, BMW forged a working relationship with SGL Carbon and established a state-of-the-art carbon-fiber weaving and curing facility at its Landshut factory in Germany, where the new car’s structure is made. BMW says using carbon fiber has helped achieve a low (for an electric car) 2,635-pound curb weight. This helps the car’s performance potential because BMW could use a smaller-capacity battery than would have been possible with a more conventional steel monocoque construction. Stylistically, the production i3 differs little from the most-recent concept. It is a modern-looking car boasting proportions like those of the Mercedes-Benz B-class but with a more contemporary look. With no B-pillars, the car uses front-hinged suicide doors, allowing excellent access to the rear seat. Power comes from an electric motor mounted low in the rear axle — a position allowing BMW to devote the space under the hood to improved crashworthiness. The synchronous motor is produced in-house at BMW’s Munich engine plant; the company says it weighs just 287 pounds and produces 168 hp. As with all electric cars, the torque is what counts, and the motor’s 184 lb-ft is 5 lb-ft more than what the Mini Cooper S’ 1.6-liter four-cylinder turbo produces. The i3 is rear-wheel drive with a single-ratio gearbox offering three driving modes: comfort, ECO-PRO and ECO-PRO+. CARS that need no driver are just around the corner according to Google, which has been testing vehicles bristling with aerials and cameras on public roads in America. But Google does not make cars (yet), so it will be up to firms that do to bring the technology to market. And carmakers are a conservative bunch. Still, slowly and steadily the autonomous car will arrive, with the help of an increasing number of automated driving aids. Volvo recently demonstrated one such feature: a car that really does park itself. Some cars already have systems that assist with parking, but these are not completely autonomous. They can identify an empty parallel-parking space and steer into it while the driver uses the brake. The Volvo system, however, lets the driver get out and use a smartphone application to instruct the vehicle to park. The car then trundles off, manoeuvres into a parking place and sends a message to the driver to inform him where it is. The driver can collect the car in person or use his phone to call it back to where he dropped it off. Autonomous parking could thus be provided at places like shopping centres and airports, which are controlled areas in which automated vehicles can be managed more easily than on open highways. In the past, designs for doing this have relied on car parks being fitted with buried guide wires that a vehicle can follow to an empty bay. That, though, creates a chicken-and-egg problem: car-park operators will not invest in such infrastructure until there is a sufficient number of suitably equipped cars on the road. Drivers, conversely, will not want to buy self-parking cars if there is nowhere to use them. The U.S. auto industry, in tatters just four years ago, is emerging as an export powerhouse, driven by favorable exchange rates and labor costs in a trend experts say could drive business for many years. In a sign of the turnaround, Honda Motor Co ., once a big importer of Japanese-made cars, says it expects to export more vehicles from North America—with nearly all of them coming from its U.S. factories—than it brings in from Japan by the end of 2014. If the pattern persists — and many sociologists believe it will — it will have beneficial implications for carbon emissions and the environment, since transportation is the second largest source of America’s emissions, just behind power plants. But it could have negative implications for the car industry. Indeed, companies like Ford and Mercedes are already rebranding themselves “mobility” companies with a broader product range beyond the personal vehicle. With all these changes, people who stopped car commuting as a result of the recession may find less reason to resume the habit. It appears toy giant Mattel has pinpointed the reason sales of its Hot Wheels brand haven’t grown over the past few years, and it’s not what one might expect. The culprit, executives claim: clueless mothers. We may be great at jazzing up dollhouses, whipping up goods in the Easy-Bake Oven and dressing up Barbie. And hey, we can probably even figure out how to turn a pile of building blocks into a fortress. But the thing is, we just don’t “get” how to play cars with our boys. At least according to Mattel vice president Matt Petersen, who runs the company’s North American boys’ toys and games division. “She doesn’t get why cars, engines, and all the shapes and crashing and smashing are so cool,” Petersen told Bloomberg Businessweek, noting this is likely because mom has never played with them. Overwhelmed and Undertrained: If 3291 American teenagers were killed by a foreign government, we’d go to war. If this were a disease, we’d declare it an epidemic. If kids were being killed by a foreign government, we’d go to war. But since these deaths happen one at a time, nine or so Donovan Tessmers every day, no one seems to care enough to do anything. Not the government, not the insurance companies, not even the parents. Upper-middle-class American parents spend almost $9000 annually on enrichment activities for their children. But $100-per-hour cello lessons won’t make most kids Yo-Yo Ma. The soccer career of the average boy or girl in a $1500-a-season travel league ends with high school. Most teenagers will drive for the rest of their lives. Brother Richard and daughter Jacqueline, age 16, came all the way from their home in San Francisco. Jacqueline hasn’t had much contact with her farm roots so I put her behind the wheel — she doesn’t drive — and helped her take the contraption out on the streets, which delighted the townsfolk congregating for the fireworks and frustrated her father. Once he gets to his destination, Mr. Clemens parks the car on the street and forgets about it. Car sharing has been around for decades in Europe and has caught on in the United States with Zipcar. These station-based car-sharing services require members to pick up vehicles from a particular place, which may or may not be convenient. Users usually need to reserve cars in advance for prearranged, prepaid blocks of time and, when they are done with the car, they have to return it to the same place — all factors that have limited car sharing’s attractiveness. Berlin, though, has become the largest one-way, car-sharing city in the world. One-way or free-floating services, which recently started in the United States, use GPS and smartphone apps for far more flexible car sharing. Cars are parked on city streets, and users pick up cars parked nearest to them. Instead of bringing the car back to a lot, users leave it wherever they find parking near their destination. They are charged for the amount of time they spend driving.